Welcome to another installment of LiveAnalysis! Today’s match-up will be just the second meeting between the World Number 3 Andy Murray and one of the top ATP prospects out there, Bernard Tomic. How did both men get here? Andy Murray is starting his Miami campaign – last year he was the runner-up, losing to Novak Djokovic in a rather uninspiring final. The Scot comes from a quartefinal exit at Indian Wells. If you want to read all about the nice tactics Murray employed against Del Potro in that match (but unfortunately didn’t result in a win), you can go here. Bernard Tomic, not ranked high enough yet to get a first round bye like Murray, beat French veteran Marc Gicquel two days ago, 7-5, 7-6(3). Bernie had to come back from a break down in the first set, too. 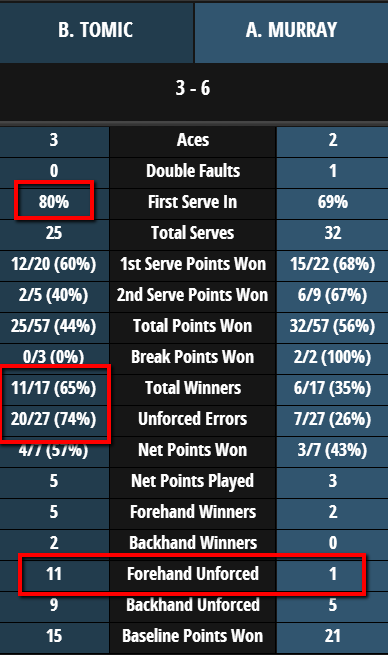 Not the greatest performance, given that Gicquel is ranked outside the top 100, hadn’t played an ATP main draw match until this point, and is 35 yeard old. Tomic comes from a rather disappointing showing at Indian Wells, where he fell meekly in the second round to Richard Gasquet. There’s not much to say about that solitary match, though it is noteworthy that not many men beat Bernard Tomic in Australian soil. That’s…. not good, to say the least. Against Murray, Tomic has to absolutely pounce on those inevitably soft 2nd serves. For one simple reason: Murray will be looking to do the same to him. 2. Can Tomic manage to engage Murray in as many forehand-to-forehand exchanges as he can? The #BernieGOAT has the edge in power off that wing, and he will do himself a huge favor of most of the points are decided by forehands rather than backhands. Not to say Tomic’s backhand is bad – but settling into AD court rallies would definitely be preferable to Murray. 3. Can Tomic resist the urge to try to out-junkball Murray? Murray would love such a contest, and we all know how much Tomic enjoys engaging in all sorts of trickery with spins and placement. But Bernie’s chance at producing the upset doesn’t lie with trickery: he needs to overpower Murray’s forehand. But just know, we might get a 30-stroke rally in which 28 of those shots are sliced backhands and forehands. You’ve been warned. Bonus: Last week Murray said that he didn’t like how the Indian Wells surface reacted to his sliced backhand. In that Del Potro match, Murray also had a lot of trouble dealing with Del Potro’s deep slices. Miami’s surface is quite similar to Indian Wells, so if Bernie watched the Murray-DelPo match, he might be inclined to repeat that formula today. First Set – Bernard Tomic will serve first. 0-0: Interesting first point: some pace from Tomic off his FH and his BH, but there was already a first sliced BH exchange. Junkball central! After that, 3 huge serves for Tomic. In unrelated news, Bernie’s hat is back! We’ve missed it. If you don’t know what I’m talking about, you need to click here. 1-0, Tomic: A few errors from Murray make it a somewhat close game, but the Scot still holds to 30 rather uneventfully. 1-1: A trend starts to appear: Tomic is trying to go for as many big FHs as he can. Which is a good call. The Aussie makes more than he misses, and he also holds at 30. So far, Murray seems to be feeling things out at the moment. No defined strategy, just his usual blend of slices, drive BHs and non-aggressive FHs. Will be interesting if the third highest ranked player in the world starts guiding rallies into specific patterns at some point. 2-1, Tomic: Murray gets into a 0-30 hole after a big Tomic return triggers an error, and a bad DF. Moments later, a horrible Murray dropper gives Bernie his first two BPs of the match, at 15-40. One is saved by a service winner. The second is saved by a great serve & volley play. An ace and a bad FH error from Murray bring us to another deuce, and then a wonderful sliced BH, big FH DTL combination from Tomic set up a third BP. The pair play a tentative point, and Tomic coughs up the bad FH UFE from the middle of the court. A bad, bad miss. Another Tomic FH UFE, and Murray has a chance to hold. But Bernie comes up with a CC FH winner, after a letcord gave him plenty of time to unload, and it’s back to Deuce. However, a bad BH UFE from Bernie after a great return gives Murray a chance to hold. But Murray lets it go by with a soft BH UFE. Deuce #4. Ace by Murray, GP again. Finally, a service winner clinches the 8 minute and 30 second game. So far, Murray has started very, very slowly. And Tomic is pressing a bit, sensing the opportunity. 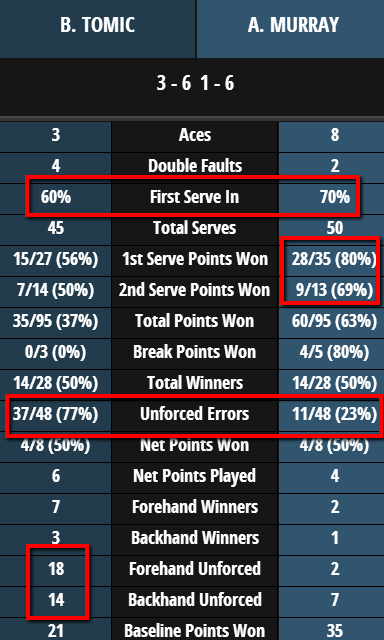 Tomic has also produced some good returns, but a rash of UFEs have negated the advantage gained from them. 2-2: Four Tomic UFEs in a row, and Andy Murray has gained a break lead. That was a pretty sorry game from Australia’s great hope. Bernie obviously couldn’t shake off the missed chances in Murray’s previous service game. Regardless, that was a pretty cheap way to give up the break. 3-2, Murray: Murray holds comfortably to 15, with the only highlight of the game being a nice BH combo by Bernie that won him that solitary point. 4-2, Murray: Tomic gets a look at some short returns, and his FH doesn’t misfire. He holds at 15, and you can’t underestimate how big that hold was – Murray had won 8 straight points at one point. So far, Tomic seems like a mixed bag of good ideas and bad execution, with the added bonus of having played an absolutely atrocious service game. Murray is reacting to whatever Tomic does, but at least he’s serving better. In Murray’s defense, Tomic hasn’t shown enough to warrant more than that. 4-3, Murray: After yet another bad FH miss, Tomic starts bouncing his racquet against the ground. Never a good thing. 15-all. After a bad BH UFE, Tomic motions as if he wants to break his racquet in half over his thigh. 40-15. Another BH UFE gives Murray the easy hold to 15. Tomic is out of sorts, and it has to be said, all the damage to his psyche has been self-inflicted. So many bad UFEs, coming from both wings. 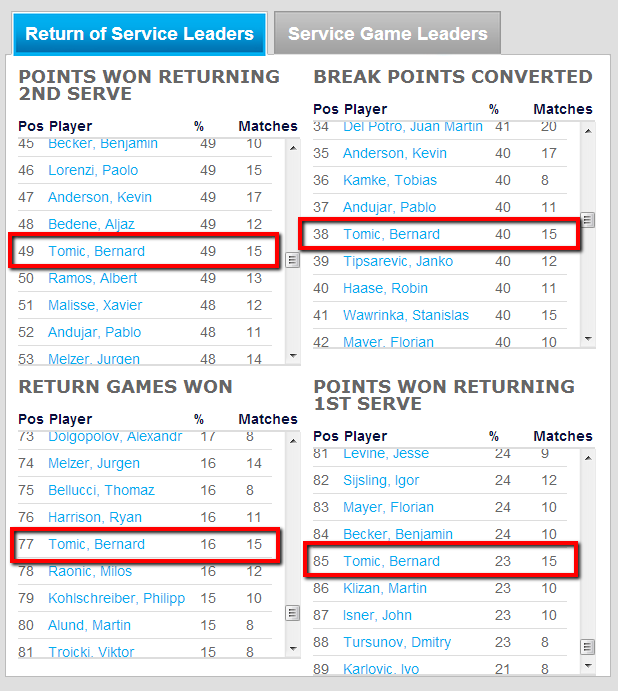 STATS UPDATE: Tomic has 18 UFEs through the first 8 games. 11 with his FH, 7 with that BH. Murray has only 7, but 5 of those are from the BH side. Odd. Both men are serving at a good 1st serve %: Bernie is at 79%, and Murray is at 69%. 5-3, Murray: Tomic hits an ace that almost broke Hawk-eye to make it 30-all. But then two cheap UFEs give Murray the break and the set. First Set to Andy Murray, 6-3. Second Set – Andy Murray will serve first. 0-0: Andy Murray holds very quickly. Bernie is still out of sorts. 1-0, Andy Murray: Tomic seems like he stopped the bleeding after racing to a 40-0 lead. But 3 straight UFEs have us at Deuce. Bernie then DFs, but saves the BP with a nice FH CC winner. It’s GP after a great FH DTL after a bad Murray dropper. A nice BH DTL winner seals the game for the young Aussie. It has to be said, Andy Murray is up a set here, and he hasn’t had to do much of anything to earn that advantage. Tomic’s body language after that fourth game of the first set, where he had 3 BPs has been quite disappointing. 1-1: Another easy hold for Andy Murray, punctuated by a laughable attempt at at tweener by Tomic. Tomic then follows that up with two straight double-faults to hand over the break to Murray. That was pathetic. No other way around it. A few boos are starting to be heard on Stadium 1. And they’re fully warranted. 3-1, Andy Murray: Another easy Murray hold. Bernie obviously trying to break the record for unforced errors in 2 sets? 4-1, Andy Murray: More Tomic UFEs, and it’s 15-40. Badly misses a dropper, and he gets booed. Again, this is warranted. Murray breaks, and will serve for the match! 5-1, Andy Murray: Murray holds to 15 in a flash. The match is clinched with an Ace that Bernie didn’t even pretend to try to return. Watched Tomic The Tank Engine with Greg Norman today. I can confirm we use the same hair dye. I don’t know – maybe shade being thrown by the opponent’s mother is just the wake up call the boy needs. Just talked to Tomic. He’s quite sick. Said he was having a lot of trouble breathing during the match. And trust me, he was sick. Sounded pretty bad, but I think he still plans to play dubs with Lleyton. At least that performance now makes a lot more sense. Not much more to say about this match, then. Except this: if you’re too sick to compete, don’t come out for your match. There’s no glory in it. Many of those who booed Tomic on Stadium 1 today won’t read about his illness. Many were probably watching him for the first time. And now that first impression is tainted. Well, I’m learning you guys don’t believe Tomic about his sickness. But I assure you, he sounded awful in the interview. Azarenka and Tomic aren’t allowed to be sick or injured. The lesson, for everyone, really, is simple: if you’re too ill/injured to compete, don’t. There’s nothing to gain from it. Particularly if it’s a huge match when you’ll be under the microscope. The potential damage far outweighs any potential benefit. Can we resurrect the “Tomic the Tank Engine” nickname? Yes. Yes, we can. Also, you should stick with Janowicz whenever you want an ATP Prospect LiveAnalysis from now on. At least he can be counted on to not go meekly into the good night. Good point – as you can see from Lindsay’s post, that Janowicz-Bellucci match was full of…things. Most of them bad, but it was certainly entertaining. Though, it should be said that Janowicz’ loss to Gasquet at Indian Wells was pretty tame, too. And not affected by illness. Unfortunate that people don’t believe Tomic just because he was playing one of the top players. Also I don’t think it was write for Judy Murray to add her opinion in there. Never liked her to be quite honest. Can’t say I’m enjoying Miami this year, feels really uninteresting without Federer or Nadal. Guess this is what tennis will be with without them though. But the BERNIE HAT makes everything better! Thanks for the live blog, don’t know if that was fun for you though JJ or painful haha? It was painful. So painful. But brief. At least there was that. Previous Entry: Searching for … The Changeover? Irnis Golbis, Nedal, Jokuvis, The Highest Paid Player, and the World’s Most Handsome Man.